In this two-part series I will strongly critique both the spirit and substance of a proposed “Green New Deal.” In the second article, I will focus on the specific proposals in the draft legislation. But in this first piece I will give the historical context and explain why the very notion of a Green New Deal is misguided, because it relies on faulty history and bad economics. To reiterate, even if you were a die-hard Keynesian who believed in the virtues of fiscal stimulus, right now—with official unemployment at 3.7% and price inflation rising above the Fed’s target—it makes no sense to launch another New Deal. But things are worse, because the Keynesian fans of FDR are wrong. The New Deal actually hurt the U.S. economy and prolonged the Great Depression. Source: Robert P. Murphy, The Politically Incorrect Guide to the Great Depression and the New Deal, p. 103. Roosevelt was elected in late 1932 and was inaugurated in early 1933. (Presidents were sworn in on March 4 back then.) As the table shows, unemployment in absolute terms remained awful for the next 8 years—it was not until 1941 that the annual average unemployment rate got back into the single digits (and just barely, at 9.9%). Even worse, fans of FDR can’t simply blame the problem on the huge hole that FDR inherited from Herbert Hoover. 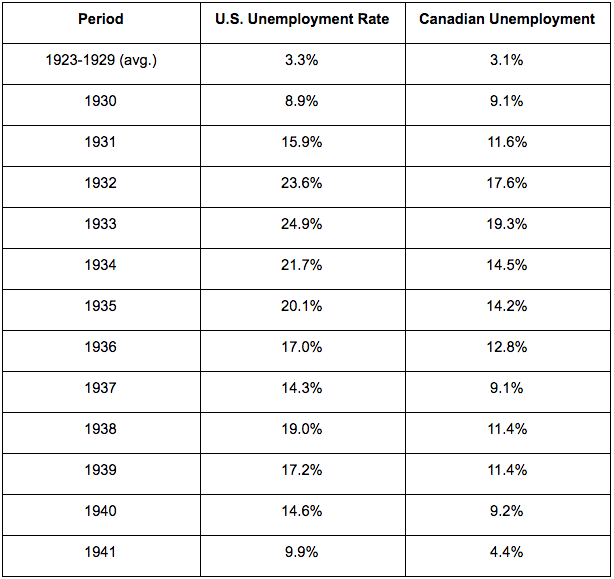 In 1933, the U.S. unemployment was 5.6 percentage points higher than Canada’s. The next year, the gap widened to 7.2 percentage points. Jumping ahead to 1938—five years after Roosevelt is sworn in—the gap between the two countries’ unemployment rates is 7.6 percentage points. In light of the above figures, why is it that people say of Roosevelt, “He got us out of the Depression”? As I ask in my book: What would the unemployment data have to look like, in order for conventional historians and the public to say FDR kept us mired in the Great Depression? Incidentally, the quixotic pundits and wonks who still plead with conservatives and libertarians to agree to a “carbon tax deal,” should see Naomi Klein in the quotation above spell it out just like so many of her colleagues before her: They are explicitly saying a carbon tax is not close to being enough to achieve their environmental goals. In fairness, some progressive outlets have grudgingly started talking about nuclear—but even the example of Grist only started in January 2018. The obvious explanation here is that these activist progressives don’t really believe their alarmist rhetoric. Imagine someone warning that a killer asteroid was hurtling toward Earth, and we had a mere decade to do something about it. And then these activists spent their time on funding medical clinics to treat society’s downtrodden when the asteroid smashed into the planet, killing billions of people. In that scenario, would you believe the activists who told you we had a decade to act before the asteroid hit? Would their actions lead you to think they believed their own rhetoric? A “Green New Deal” makes no sense on economic grounds, either in spirit or in letter. Even if one endorsed a Keynesian economic framework in which the historical New Deal “worked,” it still would be nonsensical to implement such a program today, with very high (peacetime) debt loads and an economy at officially full employment. What’s more, the historical New Deal did not in fact work, but rather prolonged the Depression. When an economy is already on the ropes, the last thing it needs is for more resources to be allocated politically, or for more regulations to rain down from Washington. Furthermore, the rhetoric of Ocasio-Cortez and her supporters shows that the Green New Deal is only distantly related to the ostensible scientific problem of greenhouse gas emissions. The people pushing a Green New Deal are using it as a vehicle to advance the traditional potpourri of the left’s political agenda. Part two of this series is available here.